A horse had to be rescued by firefighters after it escaped from a field and fell into a swimming pool in Bucks Green near Horsham. 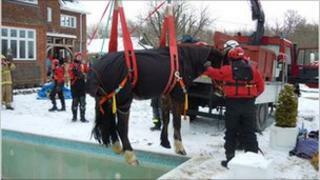 West Sussex Fire and Rescue Service (WSFRS) used specialist equipment to lift the animal from the icy water. The horse had wandered on to the pool's plastic covering, which was covered by snow, at about 0730 GMT. A WSFRS spokesman said: "We are pleased to say that Ben is now safe and well and back in the hands of his owners."